As mentor to a female possum on my hill, I have been helping her find greater tranquility in life. Before we proceed with the story, however, here’s a quick summary of events up to now. The first challenge was to overcome hostility between the possum and a raccoon that also likes to hang out around my cabin. To do this, I brought them to the negotiating table by putting two handfuls of peanuts on it. Over the course of several nights, I moved the handfuls closer and closer together until they were contentedly eating nose to nose. 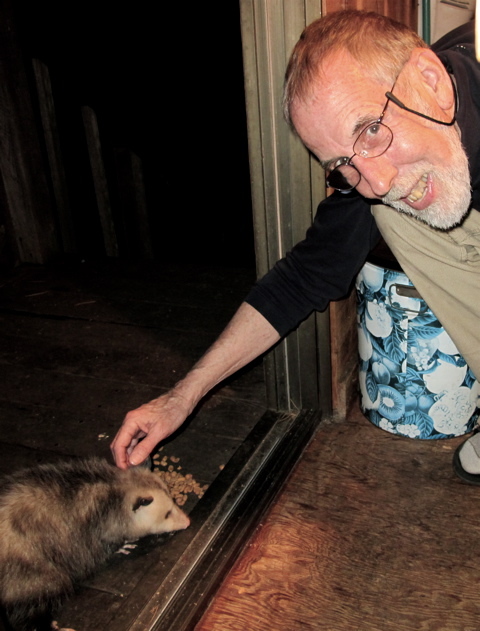 My next challenge was to teach the possum proper dining etiquette. That proved fairly easy. 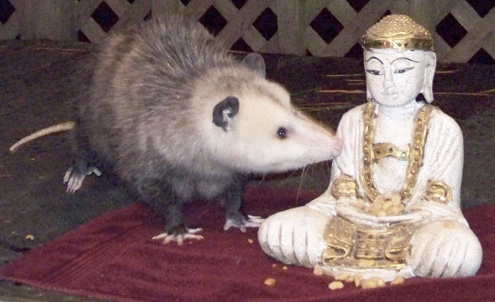 This being Marin County, I’ve now begun encouraging Ms. Possum to become a bodhisattva and begin the path toward spiritual enlightenment. Fortunately, her curiosity has been piqued, and she’s giving it a try. Resting from her sojourn, the bodhisattva achieves serenity among life’s blossoms. Many possums never find tranquility. 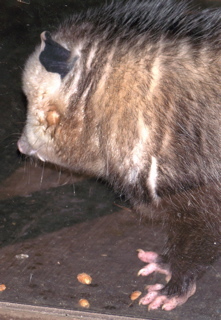 Here a male possum turns his head to show one of several bites he recently received from somebody — presumably another male. As it happened, Linda Petersen, ad manager of The West Marin Citizen, and I were watching last week when he began making moves on Ms. Possum. At first she ignored him, but when he persisted, she hissed and bared her fangs, causing him to back off. 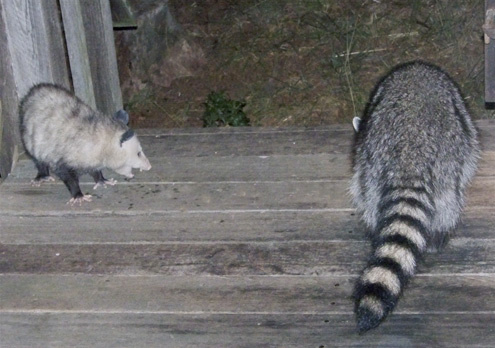 Although noticeably larger than Ms. Possum, the male is scared of me and skedaddles whenever I open a door onto my deck. From scratching her, I’ve seen for myself what excellent insulation Ms. Possum’s outer layer of fur provides. Even on cold, wet nights, her soft, inner layer remains warm and dry. However, I should stress that Ms. Possum is unusual and that you shouldn’t try this at home. 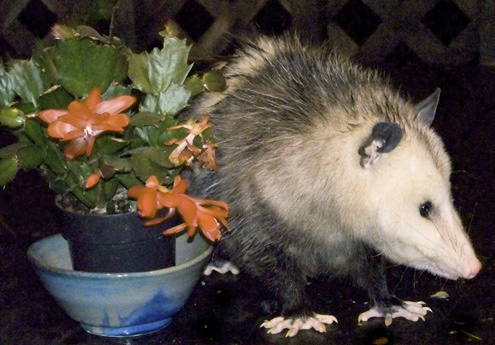 There were no possums to speak of in West Marin until 25 years ago (they’re native to the Deep South), so you wouldn’t be screwing up an established ecosystem by befriending one. But possums have sharp teeth, and you don’t want to end up like the male above with a bunch of puncture wounds. The danger is not primarily rabies. The body temperature of possums is low enough they seldom get it. Nonetheless, they can carry H1N1 (swine flu), and I always wash my hands after petting with Ms. Possum. Very funny and excellent narration and photos on the tutelage of your wonderful possum friends. Very kind of you to teach them the finer things in life. Well, guys, speaking as a female, I must take issue with the idea that there’s any “training” of Ms. Possum going on. 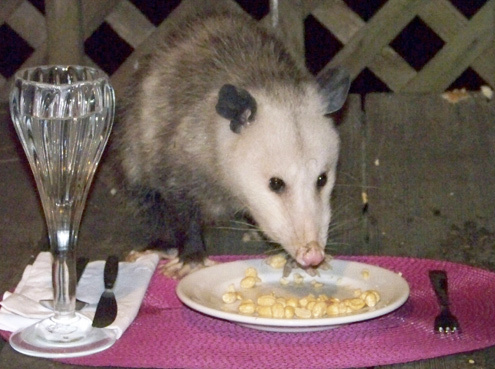 In fact, it seems to me, in view of the fine dining and flowers, the petting and the spotlight, that Ms. Possum has subtly succeeded in getting exactly what she wanted…and she didn’t have to utter a word. So who’s the one really doing all the training in this little scenario? And who’s eating out of who’s hand? Don’t worry, guys. You aren’t the first males who have suffered under this delusion of training a female 🙂 But, nice try! I appreciate the photo, the story, and foremost the kind and friendly attitude towards animals…Thanks! 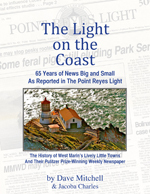 How very funny- I am currently in Fort Worth, Texas, after having resided in Point Reyes Station for almost a year. (I remember you from Geography of Hope conference last year.) A possum has recently been frequenting my back yard here, where we do the best we can to spoil the local avians. So I Googled ‘befriending a possum’ and this was the first hit. ‘Googling’ has, in this case, led to ‘giggling’. I just took him out some peanuts. We’ll see how it goes. While I was in PRS, it wasn’t odd to see Cats, Raccoons, Possums and Foxes all sharing dinner outside our door late at night. 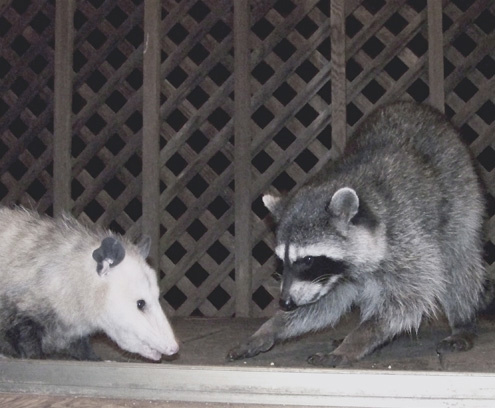 I ENJOY LOOKING AT THIS POSSUM AND RACCOON GETTING ALONG TOGETHER. I HAVE LITTLE POSSUMS RUNNING AROUND THE BACK YARD. I USED TO HAVE GROUNDHOGS IN THE YARD, AND THE NEXT DOOR MAN DIDN’T LIKE THEM, SO HE SHOT THEM WITH A PELLET GUN. YOU HAVE TO PROVE IT. I’M GLAD TO SEE PEOPLE BEING NICE TO ANIMALS. IT’S NOT VERY NICE HERE IN OMAHA. PEOPLE JUST DON’T CARE FOR RACCOONS OR POSSUMS. SOME HAVE PROBLEMS WITH THEIR GARBAGE CANS OR DIGGING HOLES NEAR THEIR SHEDS. Sparsely Sage and Timely is powered by	WordPress 4.9.10 and delivered to you in 0.610 seconds using 56 queries.